This post is sponsored by Simplee Vinyl. Hello out there in blogland! Rainy day here. That could put me in a bad mood...but not today. It's a great day for a giveaway from one of my fabulous sponsors...Simplee Vinyl! 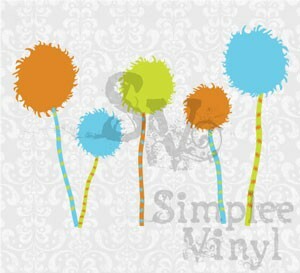 Simplee Vinyl is an etsy store with a fun selection of vinyl decals! Love these Dr. Seuss Trees! Wouldn't they be cute in a child's bedroom or a playroom! 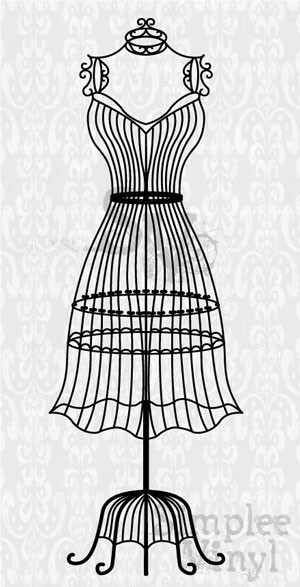 This dress form caught my eye as well! Love these whimsical little owls!! And this princess saying just cracked me up! I adored this personalized rocket as well. Perfect if you have an outer space lover! Today, Simplee Vinyl is offering one reader of the Shabby Nest a $25 gift certificate to use on anything in her shop. You know the drill. To be entered, just leave a comment on this post. If you Tweet, Facebook or blog this giveaway you can get an extra entry for each, but you must leave a comment for each in order for the entry to be counted. This giveway will be open until Wednesday, May 11, 11:59 MST. And if you're too impatient to wait, or if you're not the lucky winner, Simplee Vinyl is offering readers of the Shabby Nest 25% off anything in her shop. Just use the code SHABBYSAVERS at checkout. Good luck!!! And have a lovely Monday! This post was sponsored by Simplee Vinyl. The opinions expressed are 100% mine. PiCk Me! PiCk Me! :) HaPpY MoNDaY!! EnJoY! Awesome giveaway, my kids room could use some fun vinyl art! I shared this on my facebook page! Love vinyl for my walls! I have just discovered vinyl for my home and have been trying to decide what to get first. 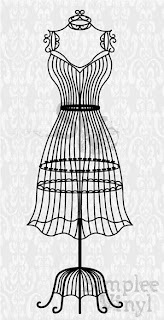 I would love to win some for my new Silhouette I just got for Mother's Day! My Monday just got brighter! i love the one that says i love you to the moon and back that one and the dr.suess trees would be great in our playroom!! I love decorating with vinyl decals!! I would love to win this!! I can think of somewhere to put all of them. Ha,ha. I am sure anyone could! LOVE IT. At first I thought - "awesome! there's someone out there who shares my love for vinyl music!" - haha... but vinyl artwork for the walls? Equally if not even cooler. I'm officially smitten. What a great giveaway...love it all...the pantry labels are too cute! Oh I love those owls! Here's hoping I win this-thanks for the opportunity! Ooo! I'm excited about this one! I love the dress form or the Keep Calm and Carry On signs. Too cute! Great Giveaway, Hope I win! I would LOVE to WIN! PICK ME!!! :) hehe Love those owls!!! MY 10-yo--the budding designer-- is planning a room redo (hot pink with black and white!!) and is BONKERS about owls!!! pick me i would love to win. I'm in the process of re-decorating my apartment and this would be perfect = ) your blog has been such a great insperation for me too thank you =) !!!! That dress form is awesome! Thanks for the giveaway! I'd love to win! We rent, so I like using vinyl to make our place feel lived in! Would like to try using vinyl in my home too! I would love to add some vinyl art to my girl's room!! Yay! I've been wanting to try vinyl! I would love to win. Thank you for the giveaway! Please enter me in the giveaway! I love vinyl signs!! Simplee vinyl has some fabulous items! Would be awesome for our "blah" renter walls! I would love to try some vinyl! I would love this! I am actually doing my little boys room in owl theme right now! Throw my hat into the ring! these are sooo fun! love those owls! What fun! The dress form vinyl is gorgeous! 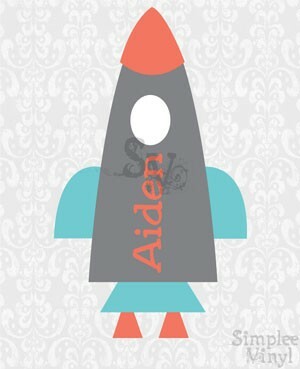 My little loves rocket ships! I would love to win! Such cute things in her shop....especially love the pantry labels! What a great giveaway!!! I love vinyl decals and Simplee Vinyl has some cute ones. I love the pantry vinyl decals. Yep, I have the perfect space...just need the perfect design! great giveaway...count me in, please! Would love to win - thanks! I love vinyl wall treatments! They are fun and whimsy and unique! The owls are adorable! I also love the princess saying! Love vinyl! I just moved into a rental and could really use some of these cute designs! Wow! These are cool! I would love to win one. I would love to win your giveaway. Thank you. I posted your giveaway and your bunk bed post : ) on my facebook. I have 21 kids and love these bunk bed ideas! 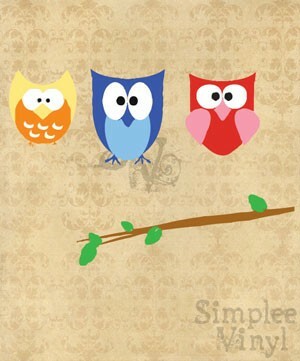 I would love the whimsical owl vinyl for my baby's nursery! and I gave you some facebook love! Awesome!!! I'd love to go shopping there! Love Etsy! Looks great! I'd love to win!